The Sony Wena Pro is a discrete smart band, transforming your existing watch with notifications, payments and step tracking. It's expensive, but if you really want to wear your existing watch, this is an innovative upgrade. In the history of smartwatches there have been some great devices, but two things always lurk in the back of every smartwatch owner's mind. Firstly, why am I wearing this thing? Secondly, why is the battery life so poor? Ask any smartwatch wearer - and inevitably it will be an Apple Watch wearer - and most often they will answer the first point with "notifications". Avoiding the need to lift the phone from the pocket to see who you are ignoring. The second point is a bugbear: once your smartwatch runs out of battery, you're wearing a £400 bracelet. Sony's Wena might have the solution. Wena - an abbreviation of Wear Electronics NAturally - got its first big reveal on stage by Sony in 2015, as part of a startup incubator project. The aim is to give you smart functions without having to sacrifice the classic look of your timepiece. For 2019 there are two Wenas (Wenae?) - the Wena Pro and the Wena Active - getting global release. We think the Pro is the more interesting device. Looking to boost your wrist action, Wena puts the smarts into the band rather than the watch - so you don't actually need to buy a new watch face at all. Rather, it has been designed to accommodate your existing wrist wear. There are adapters for 18, 20 and 22mm watches and Wena comes in two colours - stainless steel (matte rather than glossy) and black. The idea is that you attach Wena to your watch, replacing your existing strap or band, giving you the best of both worlds - your traditional timepiece and some smart functionality. 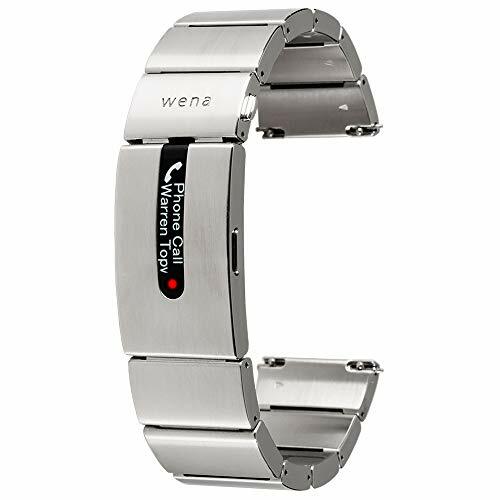 Wena is waterproofed to 5ATM and is made from 316L stainless steel, so this isn't a cheap gimmick, it feels and looks like good quality. Wearing a number of different Wena Pro models at the unveiling in London, we found it comfortable and nice to wear. Yes, we like it. A range of Wena watches are available, but they are an optional extra.A range of Wena watches are available, but they are an optional extra. If you don't have a watch to put it on, then there are a range of Wena bodies, with a range of options from automatic (we believe it's a Seiko action), solar and regular battery-powered models. The automatic has a transparent back so you can see the movement, which certainly adds horological appeal. What can Wena Pro do for you? Once you've swapped your strap over to the Wena Pro, you can wear your watch as normal, so you can tell the time and, generally speaking, look like you're wearing a normal watch. If your Wena has no charge, it's not just going to be a handful of disappointment, because your regular watch will still be running. But twist your wrist over and you'll find a small OLED display. This is a colour display and via this display you can get notifications from your watch. Colours can be customised, but there's support for text, which gives you a little more information. For example, you'll be able to glance at messages or incoming calls - and unlike a regular smart watch which broadcasts what's happening to the whole world, it will be a subtler vibration, so you can glance at it. The brains are crammed into the links of the bracelet as well as the clasp and it’s cleverly done. There's very little size difference to any other metal link band on the Wena Pro. The Wena Active is a different story as it's rubber and has a larger module on it - a bit like wearing a Fitbit and your watch in one piece. There's a button on the side to shift through display views. One of which is the time (doesn't the massive watch on the other side of your wrist give you that?) but there's also, we guess, the opportunity to leave your regular watch on home time and have Wena give you local time when travelling. You can also see the number of steps - syncing to Google Fit or Apple Health - removing the need for a separate step counter, like a Fitbit Flex, or a device like the Withings Activité. We've given mobile payments a separate section as there's a little more to say here. Wena supports payments thanks to NXP and Mastercard, so it's a reliably secure solution for contactless payments, but at launch it's only going to be supported by Boon. Boon is essentially a pre-pay Mastercard system (although there's membership fee), but it is supported by devices like Wena. It's not as complete as the offering that you get from Google Pay on Wear OS devices or Apple Pay on Apple devices, which supports most regular banks. That means that if you're really keen to use Wena Pro as a payment method, there are a couple of hoops to jump through. It's the same struggle that systems like Fitbit Pay and Garmin Pay have also encountered in the UK - offering support for high street names seems difficult. However, go down the Boon route and all you'll have to do is activate payments and hold the device to the contactless reader like any other payment method and you'll make that transaction. The thing we like about Wena Pro is that it's very much replacing your watch strap for something smarter. You can have all the smug glory of wearing a "proper" watch, with the discrete advantages of a smart watch - which for many, we suspect, is going to be all about notifications. Wena Pro is a clever application of smart technology and we like that. It recognises that some functions of smart watches are worth having, while the vast majority that offer a duplication of smartphone features are not. The downside is that there's a hefty price to go with it. Priced at £399, Wena Pro costs as much as an Apple Watch and that will likely make it a hard sell for many. But as an accessory to a £3000 watch that you love wearing, it's a smart compromise.